BARDSTOWN, KY – MAY, 2012 – Kids will see their favorite TV and storybook characters this summer in Bardstown, KY. Thomas the Tank Engine, Cat in the Hat and The Grinch will be among the Who’s Who of kid faves on the rails and on the stage in this family-friendly and affordable town in central Kentucky. Click to see Bardstown’s family-friendly things to do. 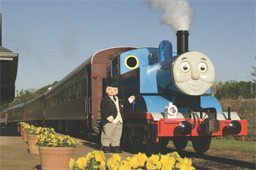 Thomas The Tank Engine rolls into Kentucky Railway Museum in nearby New Haven for a “Day Out With Thomas” on Sat. and Sun., June 2 and 3, and again on June 9 and 10. Twenty-five-minute train rides will run at 9, 9:50, 10:40 and 11:30 a.m., 12:20, 1:10, 2, 2:50, 3:40 and 4:30 p.m. NOTE: No 9 a.m. ride on Sundays. Tickets are $20 plus tax for ages 2 and up. (Save by buying tickets in advance.) Kids will have an opportunity to meet Sir Topham Hatt and to share in lots of activities: arts and crafts, storytelling, video viewing, live music, a magic show, bounce house and more. Other Kentucky Railway Museum themed excursions include pizza trains and train robberies. Settle into seats beneath the stars and watch Dr. Seuss’ most beloved characters come to life: Horton the Elephant, Cat in the Hat, The Grinch, Gertrude McFuzz, lazy Mayzie and Jojo, a little boy with a big imagination. The Broadway-style “Seussical” takes the outdoor stage inside My Old Kentucky Home State Park at 8:30 p.m. Thursday and Saturday nights July 5 through Aug. 4. If you’re in Bardstown before these colorful characters transport the audience from the Jungle of Nool to the Circus McGurkus to the invisible world of the Whos, you’re in luck. The “Stephen Foster Story,” Kentucky’s official outdoor drama and a splashy family-friendly Broadway musical, runs from June 9 through August 11. Tickets for children ages five and under are free, $10 for those ages six to 12 and $18 for their parents. Bardstown has a number of free attractions for families: Pack a picnic lunch to My Old Kentucky Home State Park and set the kids loose on the jungle gyms. Head to Bernheim Arboretum and Research Forest on weekdays to explore the nature center and hike the trails. Scare the kids straight with a tour of the oldest operating jail complex in Kentucky – the circa 1819 Old County Jail. And head to Bardstown/Nelson County Historical Museum to catch a glimpse of artifacts relating to Jesse James, Abraham Lincoln and Kentucky’s pioneers. Feeding the family is fun and affordable in Bardstown. Grab burgers and shakes at the Hurst Drug Store with old-fashioned soda fountain. Satisfy everyone’s sweet tooth at Hadorn’s Bakery. Sample Southern-style home-cooking at Mammy’s Kitchen and Pat’s Place. Score some deli goodies at the Bardstown Bowling Center. And it’s cupcakes for all at the new Sugar Buzz. Lock down for the night in an authentic jail cell room at The Jailer’s Inn Bed and Breakfast. Stretch out at Eagle Cove Cottage with its two bedrooms and two baths. Check into the Old Kentucky Home Stables and Bed & Breakfast and add swimming and horseback riding to your fun. Bardstown also has several well-known hotel chains – Hampton Inn, Comfort Inn and General Lee Best Western Inn – and excellent campgrounds: Holt’s, My Old Kentucky Home State Park and White Acres. Visit www.SampleOurSpirit.com for more details on all Bardstown’s summer events, which also include Civil War re-enactments at Old Bardstown Village the third weekend of the month. With its quintessential Southern small town sensibility, nearly 200 National Register of Historic Place buildings and charming circular Courthouse Square, Bardstown seems more like a yesteryear village than a bustling town in central Kentucky. But bustle it does: The “Bourbon Capital of the World” is a spirited community that is home to the distilleries of Kentucky Bourbon Country: Heaven Hill, Maker’s Mark, Jim Beam and Barton 1792 Distillery. Bardstown has one of the four most important Civil War museums in the country, the Civil War Museum of the Western Theatre, as well as the Oscar Getz Museum of Whiskey History and The Kentucky Railway Museum. It is the backdrop for “The Stephen Foster Story,” Kentucky’s official outdoor drama and one of the state’s 44 “There’s Only One” sites, and for a vibrant restaurant landscape that includes numerous historic dining venues and plenty of locally owned eateries, many of them situated – along with a lively collection of shops, boutiques and galleries – in the historic downtown district. Additionally, Bardstown has four 18-hole golf courses, three self-guided tours, two wineries and numerous religious attractions.